Preparations had been underway for over a month. By the time the date arrived, hundreds of thousands of small, green flags, each with a star and crescent moon, hung from buildings in the Old City section of Hyderabad, decorating the city center and the dilapidated structures of the slum alleyways. There were numerous decorated mandaps, or platforms, set up for public lectures. The street festivals that afternoon drew many thousands of residents, many of whom joined in smaller processions marked by marching, amplified religious chanting, and flag-waving; by evening, the entire city center area was lit up. 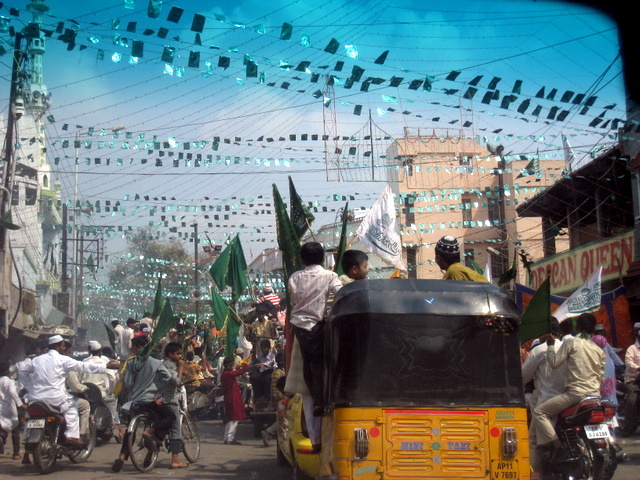 Some men in the processions wore traditional kurta-pajamas and topis, the small rounded caps worn by some observant Muslim men; others wore green headbands or turbans, or painted their faces with green paint or glitter. The latter was particularly in high contrast to the simplicity and sobriety of the traditional Islamic, especially Sunni, aesthetic. The festivals were a particularly masculine display, as women had no sanctioned role in the public festivities. Dressed in their burkas, they were visible only on the sidelines, holding their small children or riding on scooters behind their husbands. Mostly, women honored Milad-un-Nabi by attending one of the dozens of women-only jalsas—officially organized gatherings, at which participants listened to religious lectures and stories of the Prophet. While Milad-un-Nabi celebrations have ebbed and flowed over centuries in Hyderabad, it was, in the contemporary period, typically celebrated by casual family visits and the preparation of traditional food items. Only in recent years has it become a public and politicized event. My companions in the religious study circles I regularly attended were both surprised by and critical of the festival’s grandeur. Some of the women subscribed to Islamic reformist traditions that would view festival behavior as un-Islamic, and they made remarks about their discomfort with its impiety and status as bida, or innovations, of original Islamic teachings. When I arrived at the women’s study session the afternoon of Milad-un-Nabi, my companions were discussing how they had never seen such big celebrations for the Prophet’s birth date. As I had been hearing earlier from others: “It used to just be in the house. We would make kheer puris and visit our families.” Farhat, one of the teachers, mentioned that a celebratory procession the night before had led to noise complaints. A scuffle erupted, she said, leading to police violence against the Muslim celebrants and police closure of all businesses in the neighborhood. This relatively minor event was but a prelude to the three-day Hindu-Muslim riots that later ensued, in which religious festivals were implicated in 3 deaths and scores of injuries, and the city endured a curfew that lasted over a week. As Milad-un-Nabi now clearly enters the terrain of public space, politics, and even nationalist riots, the traditional role of women has lost some of its value. Historically, women likely maintained Milad celebrations in domestic spaces because they were not permitted to gather in mosques. The transfer of Milad-un-Nabi from private to public has had gendered consequences as women, who may have managed the celebrations in the domestic sphere, are excluded from public festivity of the type I saw. This example of the shifting nature of Milad-un-Nabi in Hyderabad tells us two things about gender. First, the relationship between women and ritual is not always straightforward: while women are often depicted as being attached to religious ritual, this case stands out as an example of their detachment from ritual and celebration. This is not just because ritualistic celebrations in public tend to exclude them, but primarily because they go against their notions of pious comportment. Second, while feminist theorists have long argued that women are held up as symbols of the nation or ethnic community, this does not have the same meaning or relevance across different communities. For example, Hindu nationalists have long succeeded in employing gendered discourses and mobilizing women for their cause. In contrast, the parties that publicized and politicized Milad-un-Nabi as a Muslim holiday did not exactly reach out to Muslim women or seek to mobilize them, despite women’s jalsas. There is, rather, a real tension between the role of gender and the private or public nature of honoring the Prophet. This tension, we might argue, limits the religious-nationalist appeal of the celebrations.